Day 11: How to get to the Tigers nest? On the back of a flying tigress, of course! Reader alert: ponderous post approaching! Every country is now for certain iconic moments and visuals. While Bhutan is replete with spectacular sites and vistas, one of the ones most likely to end up on a postcard is the Tigers Nest. 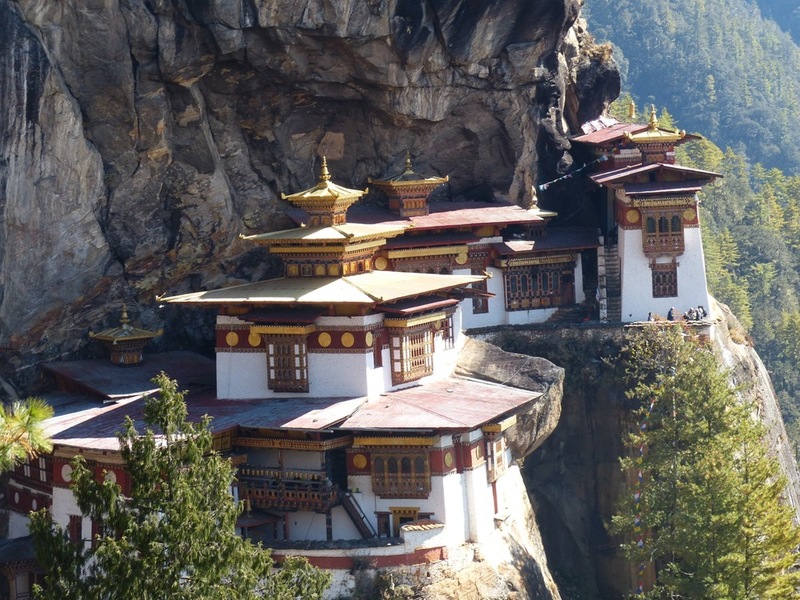 The short version: The Tigers Nest is a monastery built around caves on the side of a mountain in 1692 in honor of the Guru Rinpoche, who was credited with bringing Buddhism to Bhutan among other places. The monastery is a series of small ornamental buildings built into the mountain at an elevation of 3,120 meters (10,240 feet). Every year it is visited by thousands of tourists, followers, monks and others who must trudge up a 600+ meter climb and then work there way up and down on stairs and scale the side of the mountains until reaching the monastery. It is a strikingly beautiful temple, full of history that makes the slog up the hill very much worth it. Tigers Nest closer up. Watch your step! Stop here if you are in a hurry! As I noted on an earlier post, one of my reasons for selecting Bhutan as a place to visit goes back to a long-standing interest in buddhism. Over the years, I’ve read a lot about it and have become fascinated, and frankly helped, by the philosophy it espouses. The form of buddhism that I’m most familiar is what is known commonly as Tibetan buddhism. Before I go any further, I thought it might be helpful to provide a very small overview of the different schools of buddhism to put a little perspective around it all. Theravada (school of elders): practiced mostly in southeast Asia is countries like Thailand and Myanmar. It is horribly oversimplifying when I say that the principal aim in Theravada teachings is to help its adherents escape the cycle of suffering over many lifetimes by achieving enlightenment so that they can happily disappear into the cosmos. Fairly or not, Theravada buddhism is often seen as a way for individuals to seek their own enlightenment to help end their suffering as individuals. Mahayana (great vehicle): includes Tibetan, Pure Land, Zen and other forms and is practiced in Tibet, India, Bhutan, China, and Japan among other places. Again, I’m grossly over-simplifying to say that the crux of this form of buddhism is to achieve enlightenment for the benefit of all sentient beings. Said differently, its goal is for each of us to achieve enlightenment so we can help all others do the same, rather than disappearing. Mahayana: the slow way, sometimes called the gradual path or the middle way. Despite the reference of the term “tantric” to naughty stuff in popular culture, tantric means something quite different in buddhism. It is a demanding and powerful way of studying and seeking enlightenment most commonly associated with the buddhism associated with the Dalai Lama (Geluk school). A fundamental principle of tantric buddhism is that it cannot be learned from a book, but rather it must be transmitted from teacher (guru) directly to a student through initiation and empowerment. I will stop here as I am already giving myself a headache. Suffice to say, what I have read about tantric buddhism is that it is an incredibly complicated and extremely high commitment way of life. Nonetheless, it finds itself into the lives of many people around the world despite the huge demands it requires on its adherents. All of the above brings me back to the Tigers Nest. The story of the Tigers Nest is that it was a series of caves visited by the Indian Guru Rinpoche (sometimes called the second Buddha) in the 8th century when he came to this part of the world to help establish buddhism and to drive out the evil spirits from the land. He arrived to the caves on the back of a flying tigress (sweet! ), and he meditated for three years, three months, three days and three hours. Rinpoche is often viewed as the father of Tibetan buddhism, and he is a hugely important figure in this region and is seen as one of the gurus who helped build and promote tantric buddhism. Bhutan itself was united from a collection of tribes in the 1600’s by Shabdrung Ngawang Namgayal (referred to simply as Shabdrung) who also successfully repelled invading Tibetans. He is the father of Bhutan and is revered here. It was his want to see a monastery established in honor of Rinpoche where the caves are located. This did not happen by the time he died in 1650, but it did happen not too long afterwards. In this sense the Tigers Nest is incredibly important to the Bhutanese people for both religious reasons in that it honors Rinpoche and for nationalistic reasons, in that it honors Shabdrung. I’m grateful that I had the presence of mind to study up on all this stuff prior to making the hike yesterday. It’s a very different experience to visit a place once I know its significance, and it helped me avoid the temptation of saying, “gosh, what a tourist trap!”. They say in buddhism that there is no "self". So why the selfie?? ?